What’s good for each of us isn’t automatically good for the planet. So says a new study of diet, food waste, and environmental sustainability. “Eat more fruits and veggies” lies at the heart of a lot of advice for healthy eating. But Zach Conrad and colleagues found that more fruits and veggies also mean more food waste. Not only that, they also found more wasted irrigation water and pesticides linked to diets that include more fruits and veggies. On one environmental dimension, though, fruits and veggies came out on top. Producing fruits and veggies uses less land than other types of food production uses. Food and health policy often comes to us in simple sound bites. Eat more fruits and veggies. Less meat, more plants. Sugar is toxic. Eat less, move more. But those sound bites do a lousy job of delivering the complicated truth of food and health policy. Some of them are outright distortions. Others just fall short of being foolproof. And that’s where we are with fruits and veggies. This study points to one of the reasons that people keep falling short of recommendations to eat lots of fresh fruits and veggies. They rot and must be discarded. Or people turn down perfectly good, but ugly specimens. So we are faced with balancing competing interests. We have to figure out ways to maximize the fresh fruits and vegetables we eat, while wasting less of them. I’m in this fine-dining world, but I spend a lot of time going through my garbage. At the end of the day, it’s a business decision. You do this as a function of saving every penny that you can, because the restaurant margins are so slim right now. Real solutions to food, health, and environmental challenges come from attention to details and facts. Not clever sound bites. Those sound bites might sell a policy. But if we lose sight of the complex systems those policies affect, both sound bites and policies will fail. Eat your fruits and veggies? Sure. But while you’re at it, pay attention to the health of the planet, too. Click here for the study from PLOS ONE and here for further perspective from Live Science. For more on restaurants tackling food waste, click here. And for a comprehensive view of the issue, check out these resources from the NRDC. This is an interesting post with some good food for thought. If you are just learning about food waste, check out http://www.refed.com It is comprehensive and shares a lot about sources of waste and fixes. Keep in mind that even if more water is wasted from veggie production, much more water is used in the production of meat. No need to dig into this here, I get that the concept here is that less of the meat is wasted…. 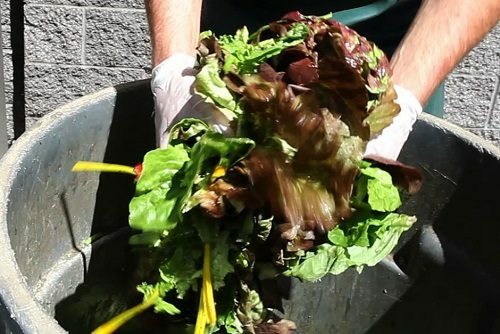 Composting also keeps food out of the waste stream – yes, not practical for everyone – and of course it would be great to use all your food, but I’ve never had to throw out any veggies or scraps, with just one compost bin in my backyard.